Traveller’s Tales & Warner Brothers Interactive Entertainment bring us a whole new Lego game, nothing licensed; Lego Worlds is like a breath of fresh air with potential, but fails to grab my attention. The game starts off in space and your space ship breaks down; it’s at this point you will begin to do a little customization of your character. Once you are finished with customizations, you will enter the first world which is the pirate world. Your objective is to collect enough gold bricks to repair your ship and go to the next world; you do this is by completing tasks for people in this specific world. Exploration is critical when it comes to completing tasks; along your journey you will pick up tools and as you use these tools you can complete the tasks assigned to you later on in order to get a gold brick. As you explore each world you will find characters to interact with, whether it be just talking or fighting and as always in each world, you pick up Lego currency which will be used for building things with your discovery tool; each discovery cost different amounts to build. Building in Lego Worlds is a large part of the game, but to compare it to Minecraft seems a little unfair when you look at all the freedom that you have when it comes to building in this game. You can build whatever you want with various Lego pieces in all shapes, sizes, and discoveries; building is a key element when it comes to completing certain tasks. When you are looking to travel to a new world you must go into your space ship and it gives you several options; there are only four worlds that seem visible and they display how many gold bricks you need to unlock those worlds, but the more you collect the farther and bigger worlds you can go to. Off to the side there are menus and buttons that give you options of what you want to do next, but it’s not clear what each button or menu allows you to do. Your options in this menu, go to a randomly generated world, do a free build which cost 100 gold bricks. 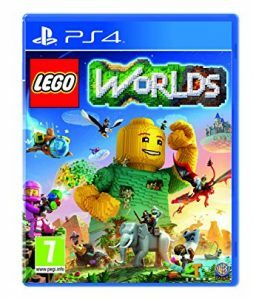 Lego Worlds has great ideas and really fun worlds, but failed to amaze in a way that other Lego Games have in the past; Lego Worlds comes off as a crossover between Minecraft and No Mans Sky.